Thats pretty much where the big points seem to come from as far as I can see. You can get more than 1 extra ball in a game, but only 1 per ball in play so they don't stack. The other points add up but don't really seem to come close to the bonus. Same, this game seems to have the majority of its points in bonus. The only big scorer I can find is the 3 lanes at the top, the lit one is worth 5k each time you go over it. I am struggling because I hammer away at the drops which eventually leads to a drain, perhaps someone else could shed some light on it? Personally my tactic is to go for the lower targets first to obtain the multiplier bonus. I start with the bottom one first then work my way up, otherwise if u get left with the bottom 2 last then it drains down the left outlane easily. Also every time the ball heads behind the bumper on the left hand I nudge my best to try to stop it running down the gulley that feeds the left outlane. Dont care where the ball goes just don't let it run down that gulley. Once I've got the bonus to 3x, I then only truly go for the extra ball. This racks up the bonus anyway. I don't hit the ball on the volley, I always stop it and then go again otherwise it ends up getting too quick to handle. Thanks for the tips Chris, I will give it a try and see how it goes. Thanks for the nice words about the games room, T3 has joined now! Just waiting for a multicade and then I will see if I can squeeze one more in haha! Mini pinball comp round yours sometime? Thanks! 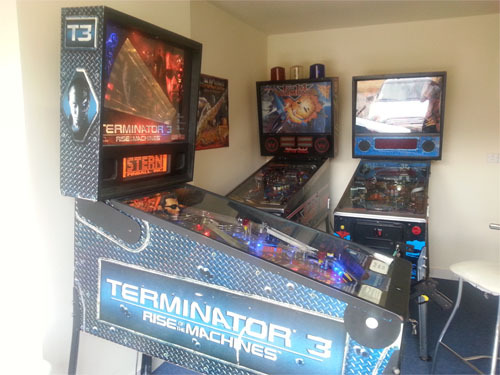 I genuinely would love to play all 3 of your machines. Perhaps 1 weekend I could drive up. Or do you have a train station near u so I could at least have a beer! I really don't think you would be able to join our list of friends using the ps4 version I'm afraid. There is a spreadsheet that @aaronhicksuk fills in each week so maybe u could just submit your score to him to add to the spreadsheet! Hi Sam. Yeah pm me the address and I will check it out. I will then work out a weekend I'm free. Would it be cool if Alex came as well. He was with me at the last pipeline meet? Whoever knew that I'd be the loser with no mates when I got my PS4. (I do have steam on my Mac, but that would mean buying tables for the 5th TIME (Ipad, PS3, Mobile, PS4 and now mac) which i can;t bring myself to do -- plus, I can assure u that the PS4 is THE smoothest version of this I've seen to date. (The lighting is really nice and the framerate is silky smooth.) so no other platform is as enjiyabe. As for tonight, I'm in Essex I'm afraid - but hopefully next time! here is a link to a thing where people from all platforms compare high scores. i can't remember who set it up now - was it you, @Wizcat ? Shall we say scared stiff for next weeks table? Scared Stiff for next week is fine with me. Its possible for people to play on platforms other than PC but it makes it a bit more difficult to track high scores. The weekly leaderboard on the Pinball Aracade website/in game is accross all platforms though so providing we know usernames then there is a way to verify scores. I haven't played on the PS4 myself but I'd imagine you'd be at a disadvantage over PC unless you can turn your TV on its side and switch to portrait mode! I'd imagine iPads and other touch screen devices are even worse. I've go the app on my android phone and its pretty much impossible to control. Good for reading about rulesets though. This is where we are holding our weekly competitions. Never thought about that, but I'm playing on a 46" plasma so the screen size probably compensates and the gameplay is smooth and faultless. I did try on the iPad but the controls are crap and there is occasional slowdown. Whats everybody think of Scared Stiff then? I have to admit I'm pretty disappointed and would say its my least favourite table I've played in the game so far by a long chalk. I managed to get the 264 mil score on my second game on it but never thought that pinball could be so boring. It just felt like the game was never going to end and offered little incentive to keep playing! I never thought I'd say this but this table actually needs to make it easier to drain balls, even when you miss shots it rarely seems to penalise and regaining control fairly trivial to achieve. Nothing really seems to be worth that many points either, even during the wizard mode which is far too easy to get to. I'd like to say I like the theme, but unfortunately that would be a lie lol! Good luck with the Scared Stiff this week, I hope you guys like it more than I do! I'm looking forward to next week already! Sorry to hear all that. Well done anyway on your usual impressive performance. I believe you are now first in the entire world for this week's high scores! Overall I'm liking Scared Stiff so far, quite a lot. The one I grew to hate was Circus Voltaire, that blooming audio: "The greatest pinball on earth" "I am the ringmaster" - oh for goodness sake shove a sock in it. I'm afraid I have to agree with Aaron, whilst the real Scared Stiff is a lot of fun the digital version is boring boring boring! Partly because it seems very easy to play (unlike El Dorado which did my nut in!) It is extremely easy to get to the wizard mode (Is it a wizard mode?) multiple times in one game so it doesn't really present much of a challenge. It's finish 6 modes, play wizard mode, rinse, repeat. I will give it a good crack one evening, my vote for next week is also Taxi! Yep I couldn't agree more. The only reason I stopped on my game was cos the missus needed to use the pc . I have got over 120 mil before and I believe that was my 2nd go when I first got into pinball back in January. Really boring table! When i got the first crate multiball I must of hit around 50 jackpots and still didn't feel I had rely scored that many points. I vote for taxi as well then. At least it's a difficult table and doesn't go on forever! Yep CV sound effects are the worst. lets NOT review my circus ability!!!! I'm beginning to feel bad about liking this table! Fact is, I'm useless enough at pinball to not have the "boring, boring, boring - goes on forever" problems you guys are having. Your welcome to it John. I'm already practicing taxi on the iPad!